The Russian overseas property market is now estimated to be worth in excess of $.22 billion. A rise of 33% in demand for property abroad in 2013. The Russian economy continues to show growth. Russia is one of the largest exporters of crude oil and the results are seen in the economy. Most Russians do not have mortgages resulting in substantial disposable income to invest in real estate abroad. Russia is home to more than 1 million so called "mass affluent" with up to $.425,000 in cash assets. Expats living in Russia are amongst the highest paid worldwide with 36% earning in excess of $.250,000 per year. 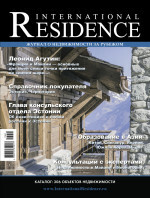 On publishing, we will use the address indicated above to send you a copy of the magazine.